All PINSTAMP® pneumatic dot peen markers are based on our revolutionary "floating pin" technology which was developed by Telesis and patented in 1985. This technology enables PINSTAMP® marking systems to accommodate surface irregularities up to 6mm (.25") and mark clearly and reliably on many types of materials. The versatile F-Series markers feature robust mechanical and optical components, and are engineered for the most challenging industrial environments. The dot peen marker TMP4750 is a pneumatic marker. It is available in both handheld and fixed mount versions. Telesis fiber lasers offer a unique combination of power, finesse and low maintenance. They are ideal for marking metals and many plastics. 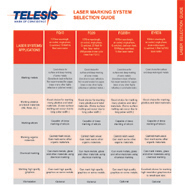 Although several Telesis marking systems are able to provide a deep mark, the TMP7000 really gets the job done. It is a robust & industrial dot peen marker aimed at applications requiring extremely deep penetration marking.